The conversion of WinHelp to compiled HTML Help. In one project, documentation was changeed from Corel VENTURA to Microsoft Word. Much text in the Corel VENTURA documents was correct and could be used in the new documents. However, the text needed much formatting. The screen shots could not be used, because they were old. The Corel VENTURA source files were ASCII text files. The Corel VENTURA files contained tags that specified the appearance of the content. The Corel VENTURA files could not be saved as Microsoft Word documents. Therefore, TechScribe wrote a VBA. The macro changed the Corel VENTURA source files into Microsoft Word by applying styles to the tagged text and then deleting the tags. 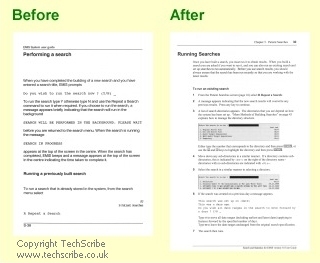 TechScribe created the documentation in approximately half the time that was necessary to create new documentation.